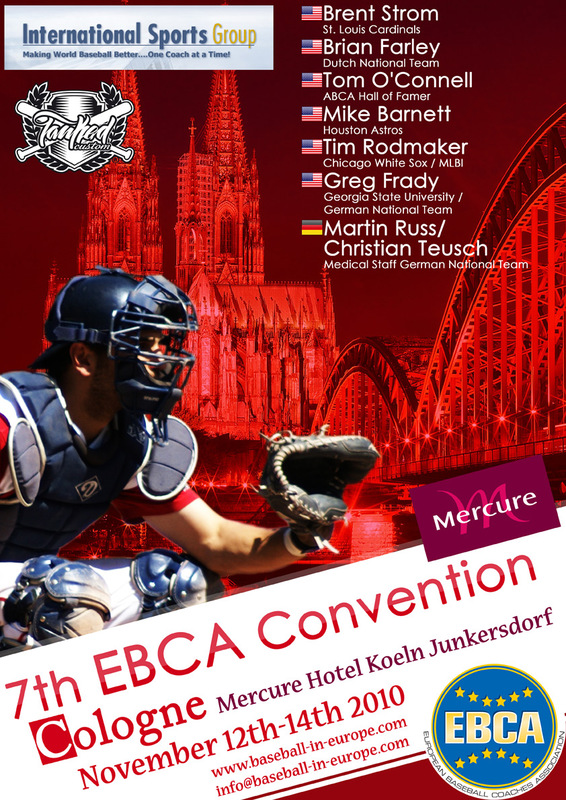 The European Baseball Coaches Association announced on Thursday the schedule for the upcoming 7th EBCA Convention in Cologne (November 12-14). Martin Russ and Christian Teusch of the German national team medical staff were added to the speaker lineup of Brent Storm, Brian Farley, Tom O’Connell, Mike Barnett, Tim Rodmaker and Greg Frady. The three-day clinic will open on Friday evening at 7pm and will last until Sunday afternoon 4pm. Topics will be hitting, pitching, warm-ups, game strategy and much more. For a complete schedule check out the attached PDF-File. Organizers also were able to push back the deadline to Wednesday, November 3rd for the special EBCA rate at the convention site Mercure Hotel Cologne Junkersdorf. There is however no deadline for registration at the EBCA convention. For further details check out a previous announcement on Mister-Baseball.